Alan Moore truly is the grandmaster of the comic narrative. His informed intricate narratives have terraformed the graphic novel landscape into mountainous range of subtext, themes and stratified interpretations. It is no wonder he has a cultish following. And here I thought it was just the beard. Or the fact he sees himself as a literal magician. Nevertheless his works have been spellbinding, so to speak, and extensive. Even Hollywood has got on board; From Hell, V for Vendetta, Constantine, League of Extraordinary Gentlemen all originated for this man’s head (albeit he distanced himself from these Hollywood productions as they in one sense or the other butchered and frankensteined his original works). It was Watchmen however that became one of the first testaments of Moore’s skills to weave intricate narratives. The narrative strands and themes that make up Watchmen are extensive. Art by Dave Gibbons and Color by John Higgins, the piece created a nostalgic tour-de-force that propelled the concept of creating an ideological universe anchored in real political and social paradigms, from the Vietnam War, the Nixon presidency and the ‘Red Scare’. One reoccurring theme, as was in Mark Waid and Alex Ross’ Kingdom Come, was “good intentions pave the road to hell”. In Watchmen we see Veidt aka Ozymandias, the world’s smartest man, devise the darnest plan to save the world from war and self-implosion. Which is all good, except it involved killing a nation of people with a alien-creature psionic WMD made to look like an alien attack. Moore bolstered his ‘good intentions’ theme in a very unique way, one I can’t recall seeing being done effectively, or at all, before or after Watchmen. He had a separate but parallel narrative within Watchmen. A comic within a comic. The Blackfreighter ( which got a little animation treatment alongside the release of the cinematic Watchmen). A feat in itself, as theoretically such a move, hopscotching from on narrative to another would be otherwise deemed disruptive. In fact Moore managed to achieve the opposite. We delved deeper into Watchmen, appreciating the fact that no matter how pure ones intentions are, tunnel-vision and dogmatism can lead to disaster. It also works due to the fact that this subset-comic is on face value simple yet powerful in it’s thematic construct. The language is poetic and engaging, bolstered further by where certain segments appear in the broader work of Watchmen. In Tales of the Black Freighter, a Captain and crew is attacked at sea by a black freighter, leaving the Captain as the sole survivor, stranded on a desert island. He believes the Black Freighter and bloodthirsty pirates were on course for Freetown, where the Captain’s family lived. In desperation, the captain uses the dead, bloated carcasses of his dead crew to make an abominable boat to sail home. Delirium and starvation set in, and his crazed quest ends up killing the very family he tried to protect. From this ‘subset’ comic, one can draw parallels and interpretations. The Captain has parallels mainly with Veidt. The impending doom of man personified by the Black Freighter. But there is a significant difference. The Captain’s actions are fuelled by the love of his family and delirium, and at the end we are left somewhat sympathising. 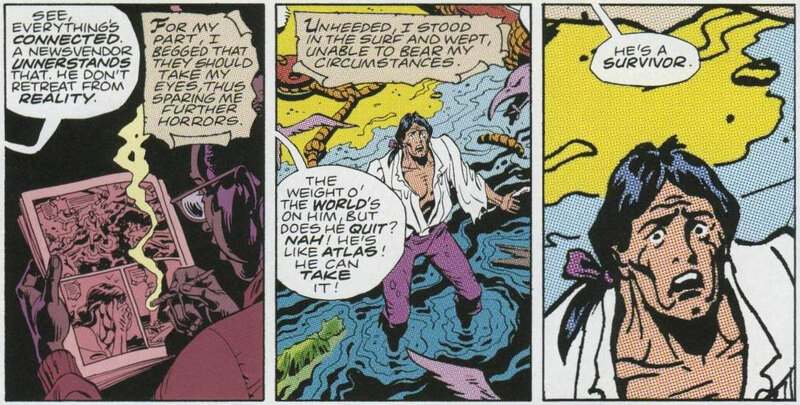 The Mariner truly is a tragic hero. Veidt, on the other hand, made calculative, strategic decisions, knowing the end result, but following through anyway. His delirium was not propelled by starvation or thirst, but by an inflated sense of self-worth. But both the Captain and Veidt were not beyond violence to secure the future of their entire world which they felt was under great threat. Narrative contructs are by no means an easy feat. Even for those considered wizards of the word. Watchmen experienced a few delays re script completion; at the end of 1986, Moore was still working on issue 9 whilst issue 5 adorned comic book shelves. But it certainly was worth the wait, as Watchmen is the Time’s list of the top 100 novels in the English Language published since 1923. Watchmen was a herald of great things to expect from Alan Moore, and will certainly stand the test of time of one of the most beautifully orchestrated graphic novel of our times.